This book, beautifully illustrated with dozens of extraordinary photographs, not only tells the history of the expeditions to explore the Columbia Glacier, but also shows how warming over the last century in combination with internal physics of the glacier act to produce dramatic and unpredictable responses to climate change. In a giant transformation, not only are we losing an enormous storehouse of fresh water, but we also bear witness to the opening up of a new landscape as more and more of the land surface formerly covered by ice and snow becomes exposed to sunlight and so welcomes new communities of flora and fauna. More than just a science story, this is a fascinating picture of how science and scientists work, of how science is carried out and advances. 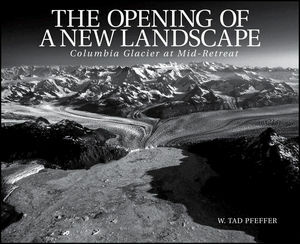 One of the world's leading experts on the Columbia Glacier, W. Tad Pfeffer, scientist, writer, and photographer, is uniquely qualified to have written this absorbing and dynamic testament to this wonder of nature. W. Tad Pfeffer is a glaciologist and photographer, Fellow of the Institute of Arctic and Alpine Research, and Professor of Civil, Environmental and Architectural Engineering at the University of Colorado at Boulder. His research interests include the mechanics and dynamics of glaciers and heat and mass transfer in snow. He has worked on glaciers for 30 years, traveling to Alaska, Arctic Canada, Greenland, Antarctica, and mountain locations in North America and Europe.